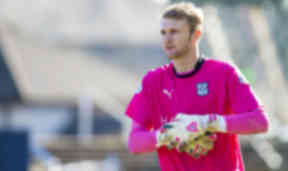 Stopper, 26, had fallen out of favour at Dens Park after reported row with Neil McCann. Hibs have signed Dundee goalkeeper Scott Bain on loan until the end of the season. The 26-year-old will provide backup for Ofir Marciano after Ross Laidlaw suffered a shoulder injury. Bain, who signed for Dundee from Alloa Athletic, was called up to the Scotland squad in 2015, but had fallen out of favour at Dens Park amid reports of a bust-up with manager Neil McCann. He told the Hibs website: "I am delighted to be joining up with Neil Lennon's squad. "From the outside looking in the side have had a fantastic first half of the season, and I hope to help them build on that in 2018. "It's a strong group of players and I am excited about meeting everyone in Portugal for the training camp. "Hopefully I can hit the ground running and force my way into the manager's thoughts."